If United SportsCar had a “Heroic Fix” award, today’s polesitter would definitely be it. 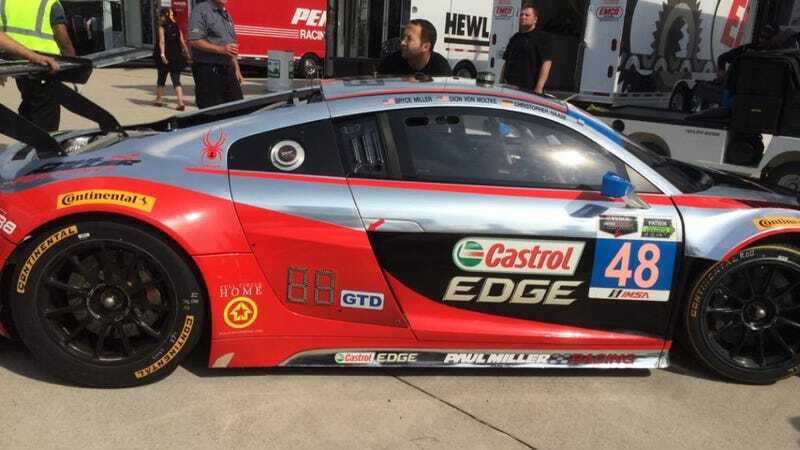 Dion von Moltke hydroplaned into the wall during a wet practice session, extensively damaging the front and rear of the Paul Miller Racing Audi. Per Sportscar365, they rebuilt the car in only two and a half hours to take pole in qualifying. Phew! Von Moltke was in the number 48 Paul Miller Racing car, which ended this wet practice session in the wall. Fortunately, he wasn’t hurt in the smack, but this threw a ton of doubt as to whether the team would make qualifying. Qualifying was less than two and a half hours after the end of the practice session and the Audi R8 LMS was a hot crumpled mess, so what did the crew do? Boom. You couldn’t even tell that anything happened when the car went out to qualify. Von Moltke showed his thanks for a rebuilt car by laying down a flying lap of 1:33.546 to take the GTD class pole position. That’s endurance racing for you. I’ll bet the crew was glad they had a break to fix a car for a change instead of having to thrash out a fix during the race itself. Today’s race may end under sporadic rain, so let’s hope no one else ends up in the wall at the end of the race. Belle Isle bites hard when you slide out of place.